The games below help children to develop a strong 'number feel' and develop early calculation strategies. The games are also simple and enjoyable to play! The connect 4 games are played in pairs. Take turns to roll two dice: either find the sum or the difference of the numbers on the dice and choose the number to cross off. The winner is the first person to connect 4 boxes. This game improves calculation fluency and also develops strategic thinking! Sum Connect 4 Roll two dice; cross off a number that is the sum. Difference Connect 4 Roll two dice; cross off a number that is the difference. 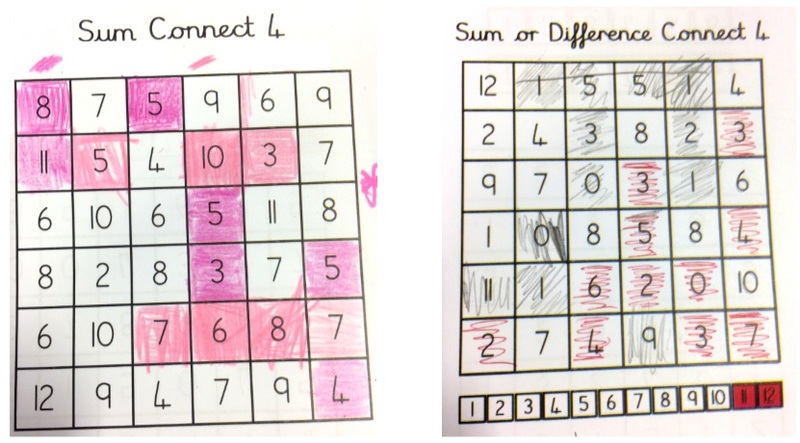 Sum or Difference Connect 4 Roll two dice; cross off a number that is the sum or difference. For this activity children roll a dice and colour in the number of circles on the dice. Then they colour in the other part. Children then write down the two parts that the whole number is broken into. Make 6 Helping children to learn number bonds to 6. Make 7 Helping children to learn number bonds to 7. Make 8 Helping children to learn number bonds to 8. Make 9 Helping children to learn number bonds to 9. Make 10 Helping children to learn number bonds to 10. The Calculation Bingo games all follow the same format: roll a dice, look for the yellow box with your number - complete the calculation in this section. Try to be the first to do all the calculations! There are visual prompts on each level; the games get progressively more challenging. 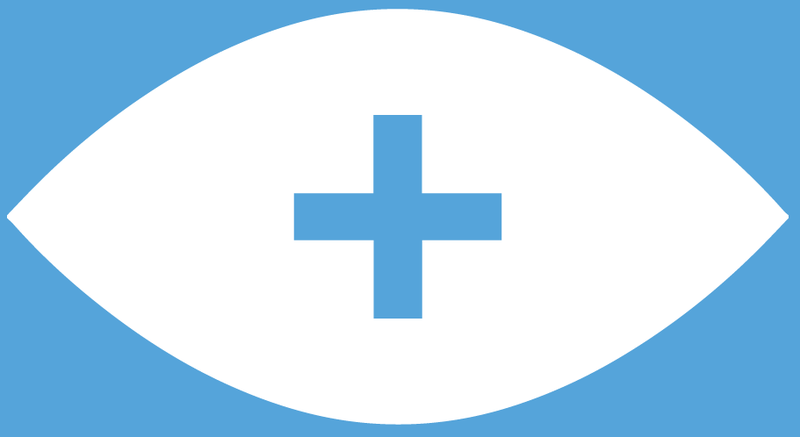 + Bingo, 10-frames 0-10 Visualise calculations within 10. 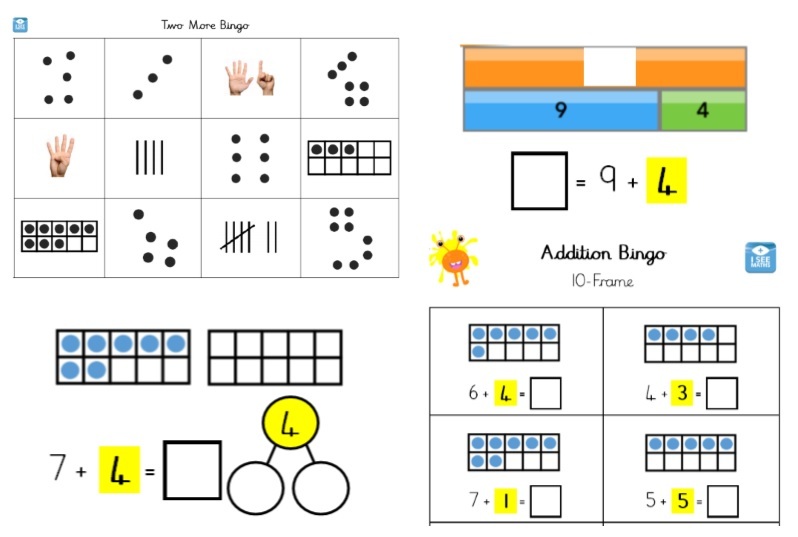 + Bingo 10-frames 0-15 Visualise calculations that border 10. +- Bingo Bar Models 0-10 Use the bar model to calculate within 10. +- Bingo Bar Models 0-20 Use the bar model to calculate within 20. 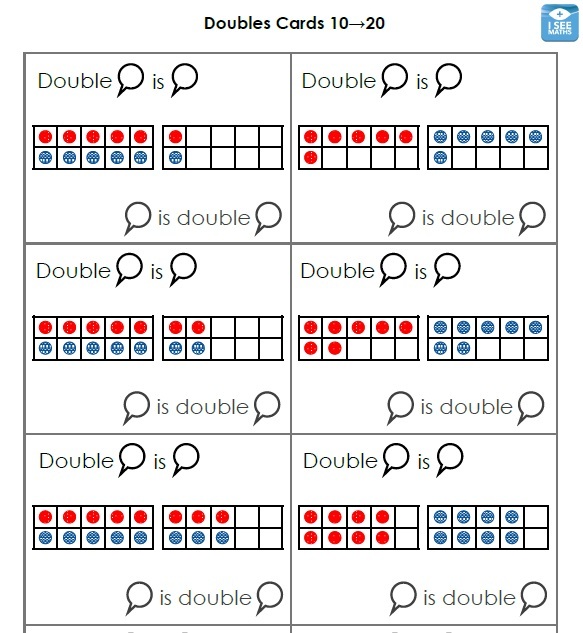 The Doubles Cards show doubles up to 20 within 10-frames, helping children to visualise these number facts. The cards need to be cut out. Turn over one card at a time and the children say the double fact shown on the card. The bordering 10 cards help children to see how single-digit numbers are broken down for addition calculations that border 10. Read this description from Nrich of how to play the Factors and Multiple game. The Factors and Multiples grids can be used to play: there are 1-24, 1-40 and 1-50 grids. Use the Factors and Multiples Next Move grids to think about the best next move. This will allow you to model to children the process of thinking a few moves ahead.